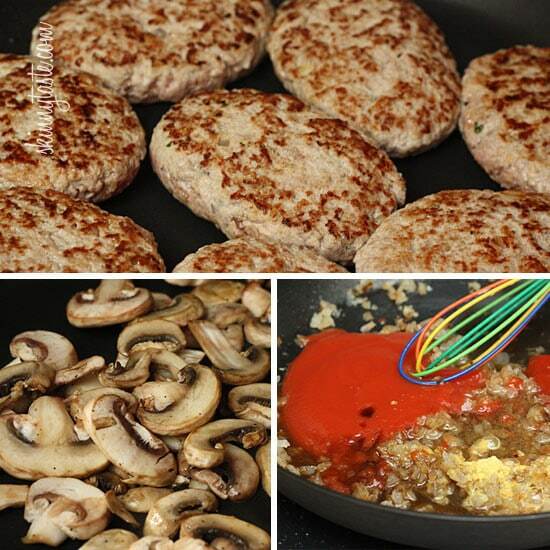 Lean ground beef and turkey are combined with breadcrumbs and sauteed onions then shaped into patties and simmered in a mushroom gravy to create a lightened, healthier version of this retro American dish. Serve this with Skinny Garlic Mashed Potatoes, Skinny Buttermilk Mashed Potatoes or for a low-carb option Creamy Cauliflower Puree and you have a complete meal. It’s hard not to imagine a TV dinners when you think of Salisbury Steak, originally a poor man’s beef dish made with ground beef and fillers, shaped to resemble a real steak back in the great depression when steak was a luxury. I recently was asked to create a lightened up Salisbury Steak, and I was excited to play around with this! For my skinny version, I combined turkey and lean beef to keep it light yet still maintain a beefy flavor. 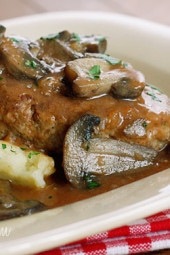 The addition of mushrooms to the gravy completes the dish sneaking in vegetables and giving this a wonderful flavor.My family loved this, from my picky teen, toddler and husband. I’m sure yours will too!! 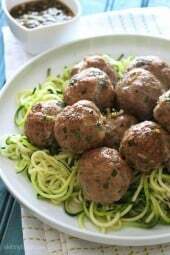 If you love this recipe, you might also enjoy my Salisbury Steak Meatballs! 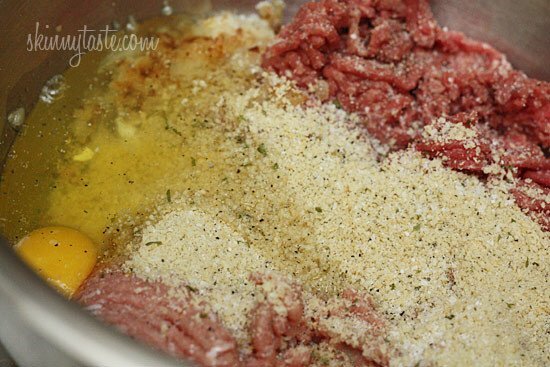 In a large bowl, combine half of the sautéed onions, ground beef, ground turkey, bread crumbs, egg, egg white, 1/4 cup beef broth, salt and black pepper. Shape into 8 oval patties. 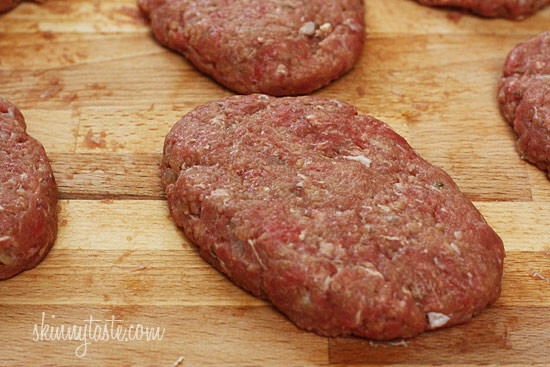 In a large deep skillet over medium-high heat, brown both sides of patties, about 4 to 5 min on each side. Set aside on a dish. In a small bowl, blend flour and remaining broth until smooth. Mix in remaining onions, tomato paste, vinegar, water, worcestershire sauce and mustard powder. Pour over meat and mushrooms in skillet. 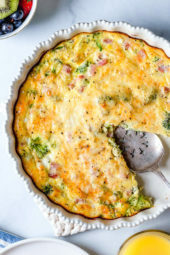 I am making this for dinner tonight and when I entered it all in the recipe builder on WW.com, it came up as 7 PPV – just wondering, do you leave the veggies out when you calculate for the PPVs? Thanks! Made this last night… My husband and I loved it, as did our 11YO daughter… Very tasty and FILLING! This is a keeper. Everyone loved it and it makes a ton so we have dinner for another night, too. We had the steaks and mushroom gravy with a big salad tonight and I intend to serve the rest with the mashed potatoes and green beans later this week. As another reviewer mentioned the reddish color of the sauce is a little off putting, but it tastes great, and that's what matters! I made this tonight and my whole family loved it. I used 2 lbs of lean ground beef because its what I had already. This will be a regular at our home. Gina- Im usually the cook of the house but tonight my mom in law made this recipe and it was good! I never post on websites but I've been a lurker for too long and Ive tried many of your dishes and family/friends love them! Thank you for sharing! Just made this for dinner and it was SO GOOD! I forgot to saute the mushrooms first and it didn't matter at all. I'd skip this step in the future, they cooked up great in the 20 minutes they were in the sauce. This is absolutely going to make it into our regular rotation. The whole family loved it. I made this tonight and the whole family gobbled it up! Thanks for a great recipe once again! Do you know what I can use in place of the bread crumbs to keep it Paleo? Maybe Almond Flour or Crushed Almonds? Is cornstarch or arrowroot paleo? I loved this! The only problem was that the meat mixture was a little too wet to form into a patty that would stick together well. Next time I make it, I'm going to leave the broth out of the meat mixture. I love skinnytaste!!! I made this tonight and loved it! Doesn't taste "skinny" at all! This is my go to meal for my steak and potato loving husband. This is so hearty and it looks beautiful when plated…at least I think so. One more thing, I loved that this made enough to serve for two more meals (at least)! I was able to make 9 patties!! I made this tonight and it was even better than I had hoped! I served it with a side of acorn squash. We didn't even miss the potatoes! Everyone of your recipes I have tried have been awesome!!!! Didn't even taste like we were eating light!! Thank you!!!! Also forgot to mention, I could not find group turkey and made it with ground chicken… litle sticky when dividing, but otherwise worked well. I made this tonight. Delish!!! The only things I changed were I added about 1 tbsp of worcheshire sauce and extra salt and pepper. I made it in the crock pot…. after I lightly fried the steaks, I put them in a crock pot, poured the sauce on top and cooked it on high for four hours! Served with regular mashed potatoes (made with skim milk and no butter) and carrots. I have enought for a few extra meals…. which I am looking forward to. So good! Served it with garlic mashed sweet potatoes and I can't believe it's not completely fattening! I can eat healthy all the time if it's this good. What if you can eat mushrooms! Can you use something else to make the gravy! Wow, never thought of using oats instead of bread crumbs. I'm trying that next time! Great recipe!! Made this last night- I even screwed it up planning on halving it- used half the meat and just one egg (no white)- but got too into the recipe and added everything else in full amounts- still turned out great! Oh and the mashed potatoes? Kind of ate two servings they were that fab. Thanks Gina! I made this tonight, it was wonderful. My fussy, don't feed me anything healthy husband loved it. Made this recipe last night and it is simply wonderful. I haven't tried anything yet that the whole family hasn't enjoyed. Keep the delicious recipes coming! I made this for dinner tonight and thought it was awesome! 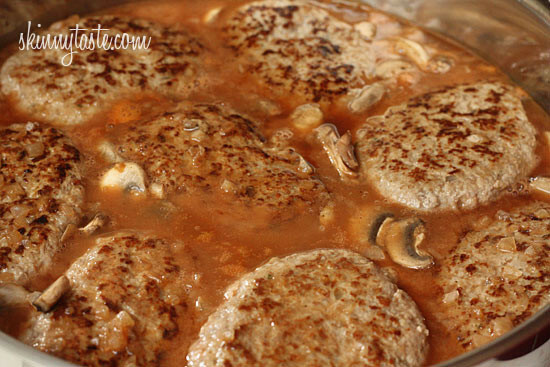 Very easy to make and the best Salisbury steak I've ever had. I served it with oven roasted broccoli. Wow! Made this for dinner last night and am so happy that I had a lot of points left for the day because I had seconds! Great recipe that I will definitely be making again. I served it with the Skinny Buttermilk Mashed Potatoes, which were also scrumptious! Thanks a bunch! Made this tonight! So good! I left out the egg white and panko and it was still good! This has become a family favorite! My toddler particularly loves it. Thank you so much! These are FANTASTIC! All five of us loved them. I have made dinner from your blog six nights in a row, and everything has been a success. THANK YOU! Made this tonight for my boyfriend and I. He loves those horrible-for-you salisbury steaks from the freezer section, so I thought I would give this a try. We both LOVED it! I used ground chicken and omitted the beef all together. If you do this, make sure to add half a cup or so extra bread crumbs. Very filling and delicious! What made it even better was that my entire family loved it! This was AMAZING!!!! Served with the buttermilk potatoes (added garlic) and the roasted green beans with parmesan. TO DIE FOR! I made these for Sunday dinner. I couldn't find lean grass-fed beef so I used Buffalo instead. They were GREAT! I was told (twice by two different people) "this is the best meal you have ever made". Thanks! I'm trying the Cuban pork next. I have made this twice, and my husband just loves it! He has bragged about this dish to all of his buddies at work, and can't tell at all that it is "skinny". Thanks for another great recipe! I never had salisbury steak before so I really have nothing to compare it to. I figured it was worth a try and it would be something different for a change. I'm glad I gave it a try because I was pleasantly surprised. It's not something I could eat over and over again since I am more of a veggie/pasta lover, but I will def add this to my recipe box and make it every so often for a nice change! My hubby on the other hand loved it and packed the leftovers up for lunch tomorrow! Is there a way to make it without the wine vinegar my mother is alergic but loves salisbury steak. What would you suggest using instead? My husband and I simply loved this recipe….we've had it for the last two nights and will have it for lunch tomorrow….the gravy is delightful …would you have any suggestions for the gravy in any other recipe? 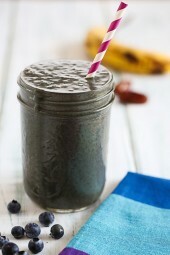 I would so love to hear from you….this is too good to waste on "one" recipe! Thank you so much. Made this for dinner last night. wonderful flavor. my 9 year old even liked it. can't wait for left overs tonight! Thanks so much for sharing! Gina this is so good! Finicky husband loved it too! My Recipe Box is full of your great recipes and every one that I've tried has been a hit…a healthy hit! Thank you so much for sharing your dishes, your mouth watering photos and for caring about our health too! Made this tonight and all I can say is YUUUUUUMY!!! Thanks for this delish recipe Gina!! O-M-G !!! made this tonight….PURE-D comfort food – NO DOUBT! I just started following you and made this recipe today. I'm not usually a SS fan, but this was AMAZING! The flavor was so full and even my picky husband loved it and said "Let's save the leftovers" which he NEVER says! Thanks for such a yummy recipe! It will be a favorite for years to come. This turned out sooo good! The husband was very surprised to find out it was a healthy recipe. I put this in the oven because I didn't have a big enough stove top pan. It was still amazing! 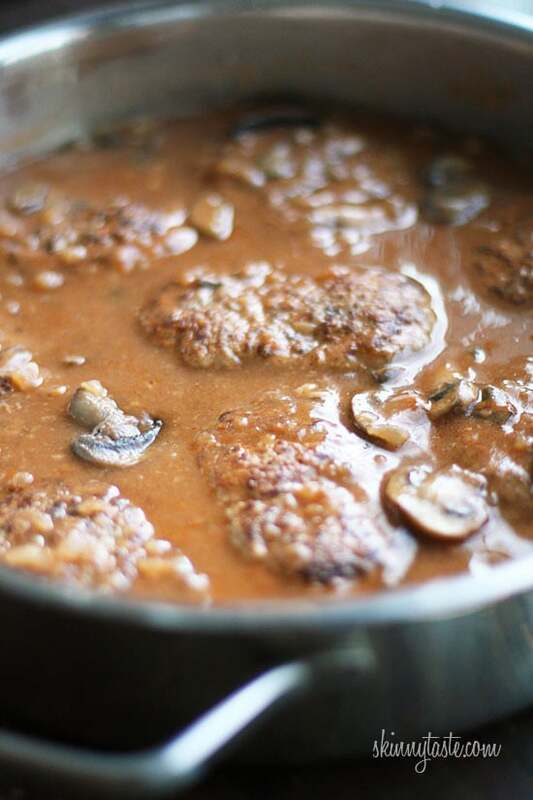 Didn't know what to do for dinner tonight, came to Gina's and saw the Skinny Salisbury Steak with Mushroom Gravy and since I had everything in my pantry…it is now simmering on the stove. Smells wonderful, can't wait to try it. Don't have any potatoes so will be serving this over brown rice. Can't wait! I love that it is such a large recipe. Three of us in the house so this will make two dinners and lunch for 2. I love planned overs. It is so nice to have the extra meals in the freezer ready to go on a night we don't feel like cooking. I made this 2 nights ago and OMG! This was so delicious. This makes a lot so it was good for leftovers and to bring to work. 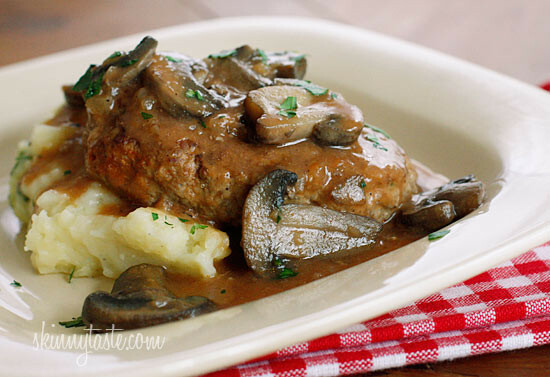 The mushroom gravy sauce is amazing and especially drizzled over mashed potatoes (yum). I did omit a couple of things like the red wine vinegar and worchestire sauce simply because it wasnt on hand. I will definitely make this again. This is a new family favorite. I am making this for dinner tonight. I am cutting the meat to one pound of ground turkey(there are only 3 of us) and I don't want the extra fat. I figure it will still have a beefy flavor with the stock and tomato paste. Serving with sauted spinach and a tiny bit of mashed potatoes. This is a great recipe! There are only 2 of us, so I made half of the recipe as steaks (oval shapes), and had double the mushrooms with each one, and made the other half of the batch shaped as burger patties (in the sauce), and then froze them to have as hamburgers another week. Both versions are very, very delicious, filling and easy! Just made this last night yum… it was a hit was trying to find something different to make. I didn't have onions or beef broth so i used a can of french onion soup it was good. Thanks again love your site. This was super yummy! Since it is just me and the hubby (My 3 year old doesn't eat much at all and the baby doesn't have teeth yet, lol.) I put some of the patties in the freezer and I am in the process of defrosting a couple as we speak. How many calories do you think it would be without the gravy? This was tasty! I was able to trick my dad into eating ground turkey (which he hates)! OMG— my kids ate this and asked for seconds! That never happens, ever. I made it with mashed potatoes and steamed veggies! This may be a staple in my menu at this rate! Really good and you get a nice portion for those on WW! Loved the flavor of the sauce. Made this tonight and the whole family loved it. Tasted just like Salisbury Steak. This was soo good! Just had it for dinner, another winner!Thanks! Wow, another yummy meal! Hubby and kids all had seconds. Thanks again. my second dish so far with great reviews/ *sighs of relief…dijon lime chicken was the first with lots of sticky thumbs up! thx for this site. I am currently on the last step, counting down the minutes 🙂 I cannot believe how much the recipe makes, it could feed an army! I feel in love with it already during my "sampling"! Just finished this for dinner, and it was very very good. Can't wait for leftovers tomorrow! Wonderful, keep the recipes coming. This was absolutely delicious. I used ground chicken in place of the ground turkey as the store didn't hav any ground turkey out when I went to the store. This week it was all Skinny taste recipes. My family loved this dish it came out so good I share some of the meal with my mom and husband and they loved it. I used Organic ground beef and I think it gave it a really good flavor. I made this tonight with cauliflower mashed "potatoes" and green beans. It was really yummy, especially the gravy with all the mushrooms and onions. Love that it's a tasty low WW point meal too. Plus, my husband loved it, so I will definitely make it again! VERY delicious! I made these for dinner last night and my husband loved and I just loved it! It came out just like the picture too! Can't believe eating healthy can be so yummy! So glad this website. Seriously cannot believe such a delicious gravy was made with no cream/fat!! Thanks for this and all of your super recipes. I started using your recipes about a month ago and now my fiance sees me making dinner and says "Skinny?" with hope in voice because we just LOVE all of your recipes. Thanks! We had this tonight and it is a keeper! I did halve the meat portion but kept the sauce quantity the same. Using half a pound of each meat, we still got 6 patties out of it which was just enough for our family. I did add a little more worc. sauce and tomato paste to flavor the sauce a little more. It was delicious! I made this tonight and the fam LOVED it!!! The gravy with mushrooms was perfect! Thanks!!! This was WONDERFUL!! I actually yelled "yum" to my own empty living room last night! Thanks so much for your website, it's saved me and my efforts at Weight Watchers! I made this for dinner tonight and it was delicious! I've added it to my "Favorite Recipes" notebook and will be making it on a regular basis. Thanks again for another great recipe! Oh, my, word! This was one of the best dinners I have made in a long time. I cut it in half, and used all beef, but otherwise followed the recipe exactly. I served it with the buttermilk mashed potatoes and peas, and everyone in the house was thrilled. (And the leftovers look much better than any Hungry Man.) We'll definitely be making this one again! I've been craving Stouffer's Salisbury steak for weeks now! For sure I'll be giving this a try! I made this with turkey and chicken broth because I had both in the house. It was sooooo good, the leftovers were even better. I visit this site every day for your incredible array of recipes! Thank you! I made this last night, along with your skinny mashed potatoes. Let me just say this dish was AMAZING! This will be a regular in my menu planning! Wow, this was great! We actually fought over who got to take the leftovers for lunch tomorrow. Thanks for another wonderful recipe! Made this for dinner last week- everyone loved it!!! Another one of your awesome recipes! Thank you thank you! 🙂 I absolutely love your site and tell all my friends about it! This recipe was so amazing that my 5-year-old son gave me a hug after dinner, I couldn't believe it! I have been following your blog now for a couple of months and plan my weekly menu off your recipes. We do gluten-free, so I always change the recipes in some way, but they always turn out amazing! I really loved this recipe. I forgot to put in the tomato paste but the gravy was so delicious that it didn't even matter. I loved the combination of ground meats. This will be made a lot in my house! Thanks! These were delish and the family loved them! This was wonderful! My husband, who usually does not like ground turkey even loved it. The kids said I must put this recipe on "the keep list"! You really know how to lighten a recipe without getting too far away from original. Thanks! I made this recipe this week and it was a huge hit. My hubby is a good sport when it comes to all the "light" food I make for him but this time he said "thanks for making me regular food". That is a big compliment! haha Thanks for all you do!! OMG!!!!!!! I made this this weekend and it was outrageous!!!! I made it with your skinny buttermilk and chive mashed potatoes and it was a hit! My husband and I LOVED it!